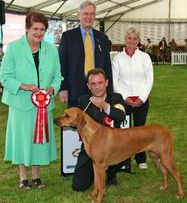 Fudge was owned by Christine Young and Frank Whyte and is the most successful Sonstraal bred Ridgeback to date having won 15 Challenge Certificates. 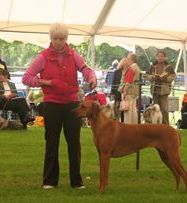 Fudge was also a regular winner in the Group ring at Championship shows, winning 3 Group 1 placings, 2 Group 2 placings, 2 Group 3 placings and 2 Group 4 placings. 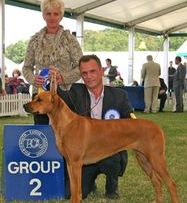 The jewel in her crown was being awarded Reserve Best in Show at an All Breeds UK general Championship show. 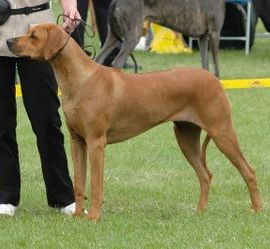 She also won Best in Show at the Hound Association of Scotland Championship show, achieved her Junior Warrant title and was Top Ridgeback Puppy. 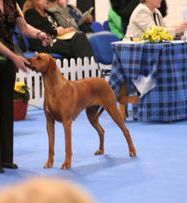 Fudge also won the Champion Stakes at Boston Championship show, and qualified for the Top Dog of Scotland competition. 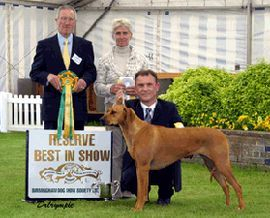 She was retired from the show ring at just 3 and enjoyed her life on the sofa with Christine's Flatcoat Retrievers. 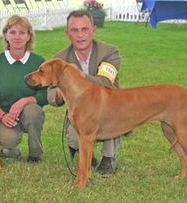 She had two litters under the Ballyriver affix. 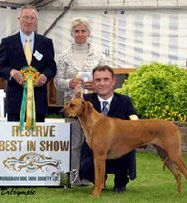 Fudge sadly passed away aged 11 and is dearly missed by all who loved her.